At Puck, we know effective manure agitation is the key to regaining lagoon capacity and ensuring an even field application of nutrients. This is why we’ve used our decades of industry experience to manufacture the best agitation solutions on the market. We haven’t looked back since building the world’s first agitation boat, using our expertise and firsthand knowledge to push our products and technology further. Our world-class agitation boats, agitation trailers, and mass mix systems are all designed to make your operation more efficient, save you money and allow you to empty the whole pit. No need for multiple tip pumps! Service any pit up to 13 feet deep! Best use of energy with single direction flow toward the pump. Can replace more than three tip pumps without sacrificing quality of agitation. 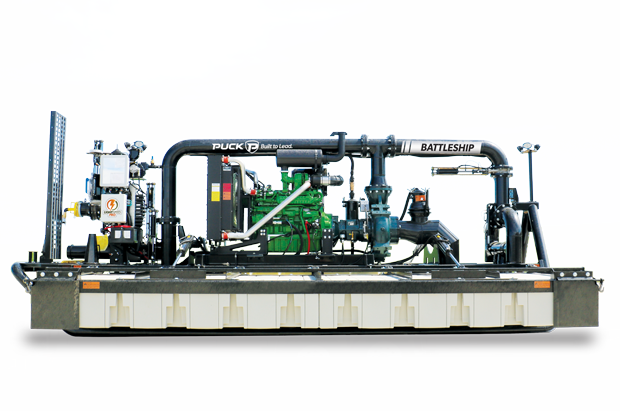 80% efficient pump provides the best fuel savings.